For believers, the Lord’s Prayer is a perfect example how to pray to our Father. Jesus gave us this example in Matthew 6:9-13. Part of Jesus’ prayer is that one day God’s Kingdom will come to earth. And depending on how you read Scriptures, you may think God’s Kingdom is already here on earth. Today Chris is going to teach that if you look at the Scriptures in chronological order—Genesis to Revelation—you’ll actually see that God’s Kingdom is not here yet. But it is coming! The belief that Jesus will one day bring the Kingdom of God to earth is called Premillennialism. We say often on the program that the Scriptures don’t have to be complicated. God wrote them for the common man. But isn’t it like man to take what God gives us and make it complicated? We’ll learn how the issue of the Kingdom doesn’t have to be complicated when you read the Scriptures as they were written. And as believers we have a wonderful story to tell the world about Redemption and a King that is coming again to rule and to reign but that also wants to save us from our sins today! Chris Katulka: Do you remember the Lord's Prayer? Our Father in heaven, hallowed be your name. Your Kingdom come, your will be done, on Earth as it is in heaven. See, Jesus' prayer is that God's heavenly Kingdom will one day be worked out on Earth. So the question is, did Jesus bring the Kingdom on Earth after He resurrected from the dead and ascended to be with the Father and sit at His right hand? Or will He bring God's Kingdom at His future return? Steve Conover: Welcome to The Friends of Israel Today. I'm Steve Conover. And with me is our host and teacher, Chris Katulka. The Lord's Prayer is one of the most familiar portions of Scripture. But whether you realize it or not, the way you understand God's Kingdom reflects the way you read this prayer and even the entire bible. Today on the program, Chris will share his insights about the way Christians see the Kingdom of God. Chris Katulka: Yeah, today I want to show the value of seeing the Scriptures from a perspective that God's Kingdom really isn't here just yet, but that it will be established at Christ's future coming. Steve Conover: We look forward to that, Chris. In the news, the Trump administration has decided to end funding to the UNRWA, that's the United Nations agency that supplies humanitarian aid to Palestinian refugees. This comes months after a gradual scaling back of financial support to the UN agency altogether. The foreign policy website reported that analysts say this would cause more hardship and possibly unrest for the five million Palestinians living in Gaza, the West Bank, and other parts of the Middle East. Chris Katulka: Well here's my take. For decades, Palestinian leadership have been perpetuating an anti-Israel agenda and neglecting several attempts at making peace with Israel because they knew money would still flow in from this UN agency. The same UN agency that approved school curriculum for Palestinian kids that tells lies about Israel and encourages hate toward the Jewish people. Taking away this funding could back the Palestinians against the wall and really force them to make some tough choices about future peace plans with Israel. Chris Katulka: Not too long ago, I was talking to a stranger about the bible. And I was sharing with them about the gospel of Jesus Christ and the type of ministry that I have with The Friends of Israel. And as we were talking about the bible, he said to me, "So that's your interpretation of the bible. That's the way you see it, right?" Now, what my friend said is such a loaded statement. He's trying to say, "That's the way you read the bible. That's not the way I have to read it." And yet at the same time, my friend is right. The lens through which you read the bible can change the way it can be interpreted. And I'm not talking about a conservative way to read the bible or a liberal way of reading the bible. Even Christians with a high view of the Scriptures can disagree on certain interpretive elements. Chris Katulka: And one of the biblical aspects that can often create disagreement in interpretation of the bible is over the issue of the Kingdom of God, God's Kingdom. Is God's Kingdom here now? The Kingdom of God that Jesus came and preached and prayed for, is it here in its fullest capacity? Or are we still waiting for the Kingdom? Now, to bring some clarity to the word Kingdom, I want to explain it a little bit. The Kingdom of God is essentially God's reign on Earth, when the Messiah, the King, Jesus Christ will come and reign on Earth physically. And in his physical reign on Earth, he will bring biblical justice and freedom and a global peace, a shalom, that can only come because every knee bows and every tongue confesses that Jesus Christ is Lord. Do you remember the Lord's Prayer? Our father in heaven, hallowed be your name. Your Kingdom come, your will be done, on Earth as it is in heaven. See, Jesus' prayer is that God's heavenly Kingdom will one day be worked out on Earth. Chris Katulka: At the end of the book of Revelation in chapter 20, the apostle Paul receives a prophecy from the Lord that Jesus' Kingdom reign on Earth will last 1000 years. It's a millennium. Satan will be bound for 1000 years. So the question is, did Jesus bring the Kingdom on Earth after he resurrected from the dead and ascended to be with the Father, to sit at his right hand? Or will he bring God's Kingdom at his future return, at his second coming? When I read through the New Testament, I can't help but see that the Kingdom Jesus preached is one that's yet to come, that the Kingdom Jesus prayed for is one that will not come until Jesus brings it at his second coming. The belief that Jesus will bring the Kingdom of God to Earth at his second coming is called pre-millennialism. And it's called pre-millennialism because biblically, you believe the Kingdom, that 1000 year reign of Christ, the millennium, follows Christ's second coming, that Christ will establish his Kingdom reign on Earth at his second coming. Chris Katulka: Now one of the reasons I hold to this view that God's Kingdom won't come until Jesus' second coming is because I believe the promises that God made to Israel in the Old Testament still matter today and for the future, and that aspects of the promises God made to Israel are really yet to be fulfilled. See, if you say God's Kingdom is on Earth now, like many people believe, then essentially you're saying God's promises to Israel, they just don't matter anymore, they're over, or they've become spiritualized in many ways within the church. See, the Kingdom promises in the Old Testament were often connected to God's promises to restore Israel to the land and to fulfill the promise God made to Abraham. Now, if God's Kingdom is here now, then clearly those Old Testament promises don't matter anymore. See, in the Old Testament, God made a promise to Abraham that Israel's land would extend from the River of Egypt to the Great River Euphrates. And when you look back over biblical history through Israel's history, you realize that that promise that God made to Abraham was never fully fulfilled. Even in Israel's biblical heyday, when King David and King Solomon ruled, the land never met those boundaries that God promised to Abraham. Chris Katulka: See, I believe the promise God made to Abraham is still waiting for its complete fulfillment. And that complete fulfillment will be seen when God's Kingdom is realized on Earth, when? At Christ's second coming. The same can be said of God's promise to King David. God promised David that he would one day have a son that would sit on his throne in Jerusalem. Well, let me tell you, Jesus is that promised son, he's the son of David. So that's one aspect of the covenant that's been fulfilled. But as for sitting on a physical throne in Jerusalem, well that's not happened yet, that's yet to come. And again, I believe that's coming at Christ's second coming. Even the promise of the new covenant in Jeremiah 31 is connected to Israel's placement in the land and their spiritual renewal through the future belief in Jesus as the Messiah. These are aspects of God's covenant to Israel that are really waiting for their completion, when? Once again, when Jesus returns and establishes God's Kingdom on Earth. Chris Katulka: I also want to kind of transition here. We talked about Revelation chapter 20 for a moment. You know, John writes that when Jesus reigns on Earth that Satan is bound for 1000 years. So try to follow me here for a moment. If you believe that God's Kingdom is present now on Earth, you're also saying then that Satan is bound and locked in the abyss. Folks, even the New Testament writers indicated that Satan is still actively deceiving believers and unbelievers today. That's why Paul encourages believers to put on the armor of God in Ephesians chapter six. He specifically says that so that we might stand against the schemes of the devil. Well, how can one be affected by the schemes of the devil if the devil is bound? Or earlier in the book of Ephesians, Paul says that unbelievers are following the prince of the power of the air, which is just another name for Satan. So how can people follow someone who again is bound? And even Peter says, in 1 Peter 5:8, "Be sober minded, be watchful, your adversary, the devil, prowls around like a roaring lion seeking someone to devour." Folks, you can't be devoured or chased by Satan if he's bound. Chris Katulka: I really hope I'm making my point clear here. Satan is not bound yet. He is still prowling around seeking to destroy people's lives, and yet an aspect of God's Kingdom is Satan's binding for 1000 years. See, for me, I believe the Kingdom of God is not here yet. There are aspects of God's Kingdom that get worked out in your spiritual life today. But as for his physical Kingdom on Earth, friends, it's yet to come. And all this matters because it determines the way you read the bible. It shows that you give value to the promises God made to Israel in the Old Testament. You know, you really see pre-millennialism, you really value pre-millennialism, the understanding that Jesus comes first and brings his Kingdom with him, the Kingdom of God on Earth, you see this the most when you read the bible, I believe, the way it should be read, from Genesis to Revelation. Oftentimes when people believe the Kingdom is here on Earth, they read the bible backwards. They read it from Revelation back. And they take the church and stick it in all of the Old Testament prophecies. When really that's not a good way to read the Scriptures. God laid things out chronologically. His promises are laid out chronologically as they reveal themselves to us from reading the bible from Genesis to Revelation. I think that's really important because it gives a value to understanding the promises that God made to Israel. Chris Katulka: And folks, you know what? It even gives us a different perspective on the Lord's Prayer. Our father in heaven, hallowed be your name. Your Kingdom come, your will be done, on Earth as it is in heaven. Give us this day our daily bread, forgive us our debts as we have forgiven our debtors, and lead us not into temptation but deliver us from evil. Jesus gives us a template to pray to the Father, a template that says, "Father, bring your Kingdom to Earth. And while we wait for that day, provide for us, forgive us, and keep us from the evil one. But most important, Lord, your Kingdom come." I love it that we have this idea of "Lord, your Kingdom come." The whole bible, I love this, Revelation chapter 22, the whole bible ends on "Amen, Lord, come quickly." Chris Katulka: Now when we return after the break, we're going to take a look at the differences between Christ's second coming and the rapture of the church. These are two different events. So be sure to stick around. Steve Conover: I think we can all agree, Scripture's teaching on the Kingdom of God can be hard to grasp. Is the Kingdom here? Or is it yet to come? Understanding the Kingdom clearly as it is taught in God's word is essential for believers in Jesus. If you would like to know more about the Kingdom of God, we recommend Andrew Woods' book "The Coming Kingdom." Dr. Woods clarifies the biblical truth of God's glorious Kingdom while exalting the coming King and edifying the reader with its constant appeal to God's word. Chris Katulka: Now, a good friend of our program, Dr. Tommy Ice, wrote a recommendation for "The Coming Kingdom." And he said this, "The Coming Kingdom is a thorough work clearly putting on display the beginning, rise, and actual coming of the Kingdom described in the bible. Dr. Woods calls attention to many of the misuses of the Kingdom that have become popular trends within contemporary evangelicalism." Steve Conover: You can order your copy when you visit FOIRadio.org. That's FOIRadio.org. We'll have a link on our homepage. Or you can call us at (888) 343-6940. 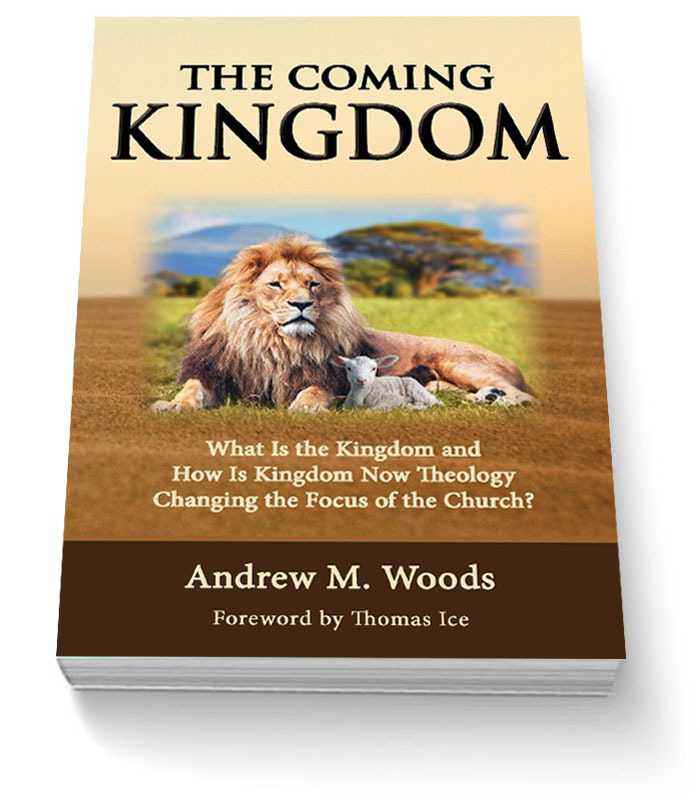 Once again, that's (888) 343-6940 to purchase your copy of "The Coming Kingdom" by Dr. Andrew Woods. Chris Katulka: Welcome back, everyone. We've been discussing this biblical concept called pre-millennialism, which is the belief that before God's Kingdom is brought to Earth, Jesus Christ must return, that Jesus is the one who will bring God's Kingdom to Earth. And this is important to understand because there are those who are amillennial, those who believe that the Kingdom is here now in its fullest capacity, there is no future 1000-year reign of Christ. And there are those who are post-millennial. They believe when enough of the world is Christianized and Christendom is completely spread throughout the world, then Jesus will return. Chris Katulka: Well, in the previous segment of the program, we studied the value of seeing the Scriptures through a pre-millennial lens. And in our study, I was mentioning the second coming of Christ, and that's what I want to focus on now. When we study God's prophetic word, we see that there is both the rapture of the church and then there's the second coming of Christ. These events, they are both prophetic, but they are separate events that are yet to happen. In 1 Thessalonians 4:16-18, Paul writes this, "For the Lord himself will descend from heaven with a cry of command, with a voice of an archangel, and with the sound of a trumpet, and the dead in Christ will rise first. Then we who are alive, who are left, will be caught up together with them in the clouds to meet the Lord in the air. And so we will always be with the Lord. Therefore, encourage one another with these words." Chris Katulka: You know, sometimes people see the rapture as connected to the second coming of Christ, or they even try to make this passage all about the second coming. And those who do that don't believe there is a rapture at all really. But as we study the text, I believe there are two separate events that are taking place here. Notice, Christ doesn't descend all the way to Earth in 1 Thessalonians chapter four, to take his seat on the throne in Jerusalem. Instead what we see is that the church meets Christ in the air, the rapture, the catching up of the church is the moment that the church is transformed and resurrected. And it's an event that marks the departure of the church from the world and introduces really God's judgment on Earth through this time period called the tribulation. And as early as 1 Thessalonians 1:10, Paul reminds the believers in Thessalonica that they were waiting patiently for the coming of the Lord Jesus. Paul was really proud of the Thessalonicans for waiting patiently for Jesus, God's son from heaven. And he says this, "Whom he has raised from the dead, Jesus who delivers us from the wrath to come." Did you hear that? Jesus is the one who delivers us from the wrath to come. That's the tribulation. That's God's judgment on Earth. So I see the rapture as God's promise to deliver the church from his wrath and to resurrect us into his presence. Chris Katulka: The second coming, on the other hand, is all about Christ's coming down. Whenever I speak in churches I always like to remind my audience that heaven isn't going up. It's when Christ comes down. If you read through the bible, God is always wanting to come down to his creation. God came down in the creation narrative in the Garden of Eden. He came down into the tabernacle. He came down into the temple in Jerusalem. He came down as the person of Jesus Christ at his first coming. And he's going to come again, and when Jesus returns, Jesus what? He comes down. And again, in the future, the new Jerusalem will once again, it's not going up, the new Jerusalem in Revelation is what? Coming down. Heaven is coming to Earth. Chris Katulka: And we just talked about this in our previous segment. Folks, when Jesus returns, he's coming all the way down. And his saints, that's you, that's me, we will be with him clothed in white as Christ makes all things new. What a glorious day that will be. And as I closed in our previous segment, I'll remind us again, I believe it's the reason that the bible ends with the hope, "Amen, come Lord Jesus." Steve Conover: Israel, on the verge of becoming a state, a teenaged Holocaust survivor arrives on her shores alone. His name is Zvi Kalisher. Little did he know his search for a new life in the Holy Land would lead him to the Messiah. Zvi, enthusiastic to share his faith, engaged others in spiritual conversations, many of which can be found in our magazine "Israel, My Glory." While Zvi is now in the presence of his Savior, his collective writings from well over 50 years of ministry continue to encourage believers worldwide. Now, Apples of Gold, a dramatic reading from the life of Zvi. Mike Kellogg: My watch stopped running recently, so I took it to a watchman in the ultra-orthodox section of Jerusalem. Two Hasidic men entered the watchmaker's shop with me and started to speak about their study of the Talmud in the Yeshiva. One of the men told the watchmaker, "Even if you are on vacation, you must study the great Rabbi's books." Mike Kellogg: I listened to them for a long time, and then I decided to enter the conversation. "If you are so faithful to God," I commented, "You should know that study alone will not get you into heaven. You must bow down on your knees and pray to God." Even after such a brief statement, they all rose against me. "What are we, Christians that we should bow down?" I replied, "Was Daniel a Christian when he bowed down three times a day before God? Many times in the bible our great prophets bowed down before the Lord. David wrote in Psalm 95:6, 'Oh come let us worship and bow down. Let us kneel before the Lord our maker.' Was David a Christian? And what about you? On Yom Kippur you bow down many times and cry, 'Adonai, Adonai.' If, as you say, only Christians bow down to pray, then you are just like them." Mike Kellogg: "Never," they shouted. One of the men said, "Our rabbi would be able to answer you." I asked, "How is it that you have studied all your lives, and yet you cannot give correct answers about your faith?" These men displayed all the outward signs of being religious, but they were empty inside. Then they asked, "Why do you try to act so religious? We can tell you are not. Yet you want us to do what you say." I replied, "I have never said you should do as I say. God has told us to obey the law of the Lord and not to follow other gods. But you are wasting your lives studying the writings and traditions of men." Mike Kellogg: The watchmaker then said, "This reminds of an occasion a few years ago when a man came into my shop and spoke just like you. He was a missionary. Are you one of them?" I told him, "I believe in the living God Messiah Ben David. You sing about him every Sabbath, but you do not believe in him in your heart. Did you know the words Messiah and Christ mean the same thing?" At this, they all jumped around as if they had been bitten by a snake and they said, "This can never be. We will ask our rabbi." I replied, "I'll be waiting for his answer." You never know how the Lord will use such a situation, and He has said in Isaiah 55:11 that his word will not return to him void. I pray these men will remember our conversation and turn to the bible, the true word of God. Steve Conover: Thank you for joining us for the program today. Chris, I'd love for our listeners to know about some speaking engagements you have coming up. Chris Katulka: Yeah, you know, this month we have our two national prophecy conferences on September 7th through the 11th. So this weekend, if you're in Lancaster, I want you to come on out. It's a free conference. We'll be studying the Olivet discourse. And you can find out this information at FOIRadio.org. And also, for our Canadian listeners, I'll be in Winnipeg at our national prophecy conference up there September 27th through the 29th. You can get all of this information about our national prophecy conferences right on our website FOIRadio.org. Steve Conover: And The Friends of Israel Gospel Ministry has been sharing the love of the Messiah and supporting Israel and the Jewish people since 1938. To financially support The Friends of Israel Today radio ministry, visit that same website Chris just mentioned FOIRadio.org. THat's FOIRadio.org. Or you can call our listener line at (888) 343-6940. Again, that's (888) 343-6940. You can write to us at FOI Radio, PO Box 914, Bellmawr, New Jersey 08099. Again, that's FOI Radio, PO Box 914, Bellmawr, New Jersey 08099. And please, let us know where you're listening when you call or write. Our host and teacher is Chris Katulka. Today's program was produced by Tom Gallione, co-written by Sarah Fern. Mike Kellogg read Apples of Gold. Our theme music was composed and performed by Jeremy Strong. And I'm Steve Conover, executive producer. The Friends of Israel Today is a production of The Friends of Israel Gospel Ministry. We are a worldwide Christian ministry communicating biblical truth about Israel and the Messiah while fostering solidarity with the Jewish people. Scriptures teaching on the Kingdom of God can be hard to grasp. Is the Kingdom here or is it yet to come? Understanding the Kingdom clearly as it is taught in God’s Word is essential for believers in Jesus. If you would like to learn more about the Kingdom of God we recommend Andrew Woods’ book, The Coming Kingdom. Dr. Woods clarifies the biblical truth of God’s glorious Kingdom, while exalting the coming King and edifying the reader with its constant appeal to God’s Word. Zvi visited a watchmaker shop in the ultra orthodox section of Jerusalem. Inside were men discussing how to get right with God. Zvi listened for awhile as they talked about their rabbis and their commentaries. He finally jumped into the conversation and began to ask questions. The men tried to cut the conversation short, but Zvi continued asking hard to answer questions, not to trap them, but to make them think. Listen how he shared the message of the Good News to these men. would like to know more about israel and Jesus.